The smartphone of today has become the ultimate example of convergent technology. These devices take razor-sharp photographs, record Full HD 1080p video, play video games, read books, play music, besides taking the occasional phone call and sending/receiving a text message. With so many functions, these devices aren’t really the best when it comes to lasting long on a full charge. Keeping that in mind, it’s important that you conserve as much battery as possible so you don’t have to face a situation where you really need to use your phone and you find out it has no charge left. Apps that let you create profiles/schedules are really handy when it comes to this. WiFi Timer is one such app. Check it out after the jump! 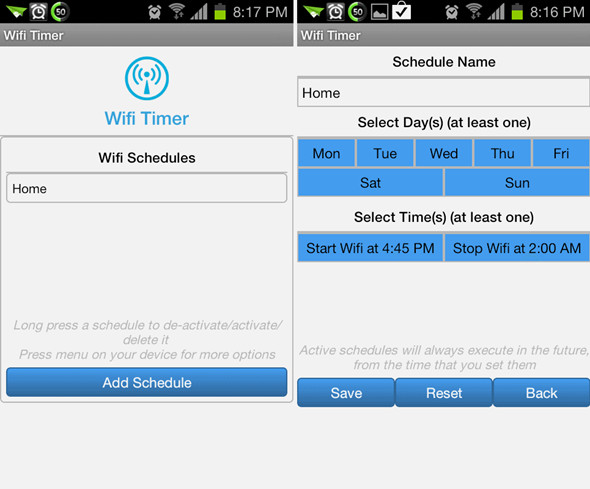 Developed by Zeiger Apps, “WiFi Timer” [Google Play] is a simple app that lets you schedule Wi-Fi on your device. You can set it to start and stop at specific times. The app’s main use is to save your phone precious battery life which it gulps down when searching for Wi-Fi signals all day. When you launch the app, you are presented with a WiFi Schedules menu where you can see all your set schedules. This menu is obviously empty when you launch the app for the first time, so you can go ahead and tap Add Schedule at the bottom to populate it. Inside the Add Schedule menu, you have options to enter a name, select days of the week and the time of the day. The “time of the day” option comes with two parts: time at which Wi-Fi starts and when it stops. You are required to choose at least one option. WiFi Timer is a very nifty app for those of you who have long commutes or any daily activity in which you never come across any connectable Wi-Fi network. We highly recommend it for people who face such scenarios. This may be unasked for considering how it’s developed for Wi-Fi only, but it would be great if the developer added the ability to schedule data connection as well. Don’t forget to let us know what you think of Wi-Fi Timer by leaving a comment over on our Facebook and Google+ page!